Did I see somebody say Toad sold 40% less than the Wii U opening week? That seems a shame. Is that the first time that's happened with a Wii U port? The original released during the holidays. And I think Hyrule Warriors also sold less on Switch. Xbox One is really weak in continental Europe. It's not only Italy, you can say the same for Spain, Germany, France, etc. Hooray for Crash Bandicoot. Keep on being awesome! Calling it now: Octopath is going to be #1 in France this week. That's not really a risky call. It's pretty obvious imho. I'll take an easy victory then. Call it smart risk-taking :p.
More importantly it was a ”big” release on the WiiU....while it's just one of many selling Switch titles this week. So yeah more competition and it's obv. not a completely new release. Sounds about right sales wise....legs should be quite a bit healthier than in WiiiU. 6        4              GOD OF WAR    PS4    SONY COMPUTER ENT. SONY COMPUTER ENT. 9        16              DETROIT: BECOME HUMAN    PS4    SONY COMPUTER ENT. SONY COMPUTER ENT. -        40              PLAYSTATION VR WORLDS    PS4    SONY COMPUTER ENT. SONY COMPUTER ENT. 6        5              GOD OF WAR    SCEA SANTA MONICA    SONY COMPUTER ENT. SONY COMPUTER ENT. 11        16              DETROIT: BECOME HUMAN    QUANTIC DREAM    SONY COMPUTER ENT. SONY COMPUTER ENT. -        38              PLAYSTATION VR WORLDS    LONDON STUDIO    SONY COMPUTER ENT. SONY COMPUTER ENT. So many Switch titles on the charts. Not something I'm used to seeing lol. Totally anecdotal, but it seems to me Microsoft shoot itself in the foot here. X360 was definitely competitive despite being basically Sonyland. Are we not getting Europe wide sales? on which link they are published? and on which day? i think it is released weekly or is it monthly event? Smartphones overtook PC in Germany as the most popular gaming device for 2017. What happened to State Of Decay in the individual chart? Edit #39 on all formats. Switch SW taking up most of the top 10. It seems to be doing very well pretty much right across the EU. Octopath’s success is solidified, and that warms my heart. I find Octopath presence in these two territories impressive, given that the last couple of times I looked at AU and NZ charts, there was not even a single Switch title in the top 10. Octopath is doing pretty damn good. Octopath Traveler is performing way better than Bravely Default in all Pal territories. If Bravely Default sold 600,000 units in its first 8 months, Octopath should manage to sell 1 million units outside Japan by the end of the fiscal year. Only we have the subject of the article. I suppose more information is coming soon. Well at least we know it had a hell of a week debut. That is guaranteed, you should think beyond that. Must have been published ahead of time by accident? It is already the info about the European charts. The GSD chart reveals that new release Octopath Traveler on Nintendo Switch had to settle for No.2, although Nintendo eShop data is not included in these charts - so it's unknown as to whether the game was really No.1 or not. If you look purely at boxed sales, Octopath Traveler was the No.1 selling game across EMEA regions. On the individual platform combined chart (retail and digital), Octopath Traveler was No.1, beating the PS4 version of FIFA 18 (Octopath Traveler digital sales are not included here either). 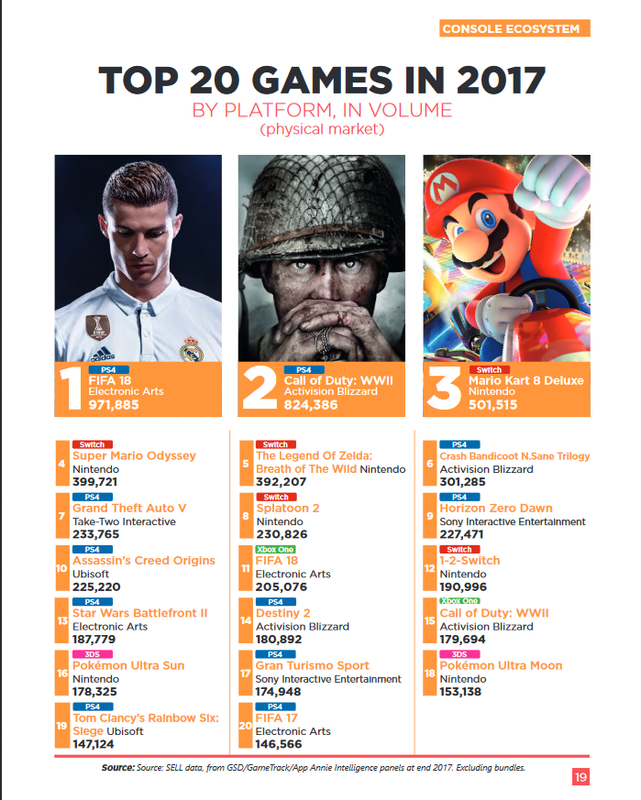 Nintendo Switch continues to dominate the boxed charts across EMEA, the Top Three boxed games by platform are all Switch titles (Octopath Traveler, Captain Toad and Mario Tennis Aces) - for the entire Top Ten, seven of the games are Switch products (the three non-Switch games are FIFA 18, The Crew 2 and GTA V on PS4). It's not clear how the machine's games are performing digitally, however, as Nintendo does not share that data. All I need is the article saying Octopath reached 1 million in sales. I'd say the switch SW in general is surprising. I haven't seen the data from Aus or NZ for a while but u don't remember the switch SW placing highly very often. So Nintendo doesn't share digital sales data, but nonetheless they have six exclusive Switch games in the combined top 10? Seems impressive. I never go in there. It’s like in its own bubble. Sea of Thieves coming back in through bundles isn’t something I expected. Is the UK as supply constrained with Octopath as other european countries or is this just the typical 2nd week drop? "In-between those games is the updated release of Sonic Mania - Sonic Mania Plus - which makes No.5. The game sold best on Nintendo Switch (52% of sales. PS4 accounting for 34% and Xbox One on 15%)." "Last week's impressive Octopath Traveler takes a not-unexpected sales drop of 60% week-on-week, which sees the game fall all the way down to No.16. A 60% drop in its second week is perfectly reasonable for a niche game, although the chart drop looks more severe due to rising sales across other titles." Those amazon bundle prime day deals doing work. I did wonder how much Amazon would affect things seeing as they had two xbones sitting in their top 10 last time I looked. How much did the game sell in the UK alone? >500k? FH4 going to break some FH records in the UK.